UPDATE: The US version of the Samsung Galaxy Tab 2 (10.1) will remain dual-core and its shipping date is still May 13, with preorders starting May 4, Samsung clarified for us. The Samsung Galaxy Tab 2 (7.0) might be giving Amazon's Kindle Fire the creeps with its budget pricing, but its larger brother Galaxy Tab 2 (10.1) will likely see a delay. It's all for good, mind you - Samsung is rumored to swap the originally planned dual-core processor in it with a quad-core endeavor, so this will inevitably mean some retooling and a bit more testing, hence the launch delay. Quad-core is good for marketing purposes and as far as production costs go it is not much different than dual-core, especially if Samsung uses its own Exynos processors, but even if it has some Tegras lying around, the difference in assembly price should be insignificant. The 10-incher is codenamed Espresso and apparently scheduled for June launch. The Samsung Galaxy Note 10.1 is also said to receive a spec bump to the quad-core goodness, so it's anyone's guess if this will delay the tablets' announcement, or Samsung's engineers will manage to fit them on time. 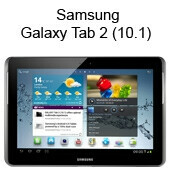 You can check out preview of the Galaxy Tab 2 (10.1) in its dual-core variant while waiting. actually...both of them are now rumored to receive the quad core goodness.. Although nice, I'd hope they would put a quadcore A9 exynos and save the a15 for the Note 10.1. If it isn't at least 1080p I will pass.